Starting Yesterday it is National Library Week! There is a host of different events National Library Week is sponsoring that you can check out below. If none of those strikes your fancy your local library is probably hosting a fun event or two! The entire reason for National Library Week is to get people to their local libraries. Libraries are a center for community and communities matter. Engaged communities that foster learning have lower crime statistics, and a higher percentage of kids going to higher education. So go out, get involved, and support your local library! On April 18th it is Teen Lit Day! In honor of this momentous day Readergirlz are organizing a Rock The Drop event where you can donate a book to a local library, hospital, or leave a book anywhere (I wouldn't recommend this in SD as it did just snow, but listed below are places you can donate a book). Print a copy of the bookplate and insert it into a book (or 10!) On April 18th, drop a book in a public spot (park bench, bus seat, restaurant counter?) Lucky finders will see that the book is part of ROCK THE DROP! Post the banner at your blog and social networks. Proclaim that you will ROCK THE DROP! 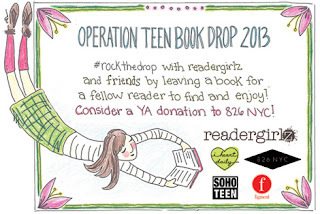 Snap a photo of your drop and post it at the readergirlz Facebook page. Then tweet the drop at #rockthedropwith all the other lovers of YA books. Also with the Boston Marathon it'd be great to show kindness! Thanks for sharing!